Sixteen members of the Faculty decided to spend the September recess writing. We checked into Goedgedacht Farm on Monday 5 September, and started with a slice of Mic Barnes's "Death by Chocolate" cake to celebrate my birthday. 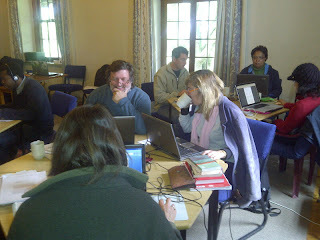 Then we quickly moved into our rooms and before lunch we had all settled down to a good dose of writing. I managed to finish the article that Farivar Rahimi and I received back from Educational Technology and Society more than a year ago, and to resubmit it. Ayesha and Thabisa decided to split their original paper and develop three articles from it. Rael and Jay are converting conference papers into articles for peer-reviewed journals. Mic is working on her proposal. Amanda, Jannie, Diane and Beverley are catching up on their Masters' theses. Eddie is working on multiple papers. Laban is making sense of his PhD and Monica is writing an piece for James Garraway's booklet, as well as for an international journal. Andy Bytheway provided really valuable insights on Monday, Tuesday and Wednesday. In fact on Tuesday he ran the show when Rael and I did a workshop on incubation in the Fringe. Wednesday was one of those rare Cape winter days when the temperature rises to 30 degrees, and we chose mid day for a "Cool walk" through the Eco-village. What started off as a 30 minute stroll ended up taking two hours, but it was fantastic. Today, (Thursday) is cold, rainy and misty. So we are all crammed into the living room of the main house and working in deathly silence, except for the furious rattle of notebook keys. It is amazing the levels of concentration people can reach. It is amazing the levels of energy that can be felt in complete silence. I wish I had done this two years ago when I first wanted to. I wish I could do one once a month.